"If you want the best, this is it. 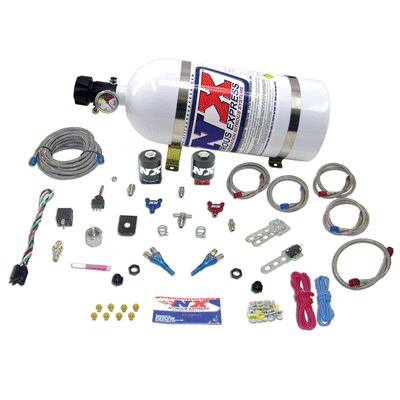 The NX EFI Dual Nozzle nitrous system is the top of the line EFI power booster on the market. From the highest flowing solenoids, to our patented Shark nozzle, this system screams nothing but quality. Includes jetting for 100 - 300HP. System comes complete with 10lb nitrous bottle, stainless bottle bracket, Lightning solenoids, extra long stainless braided N2O line, and all necessary hardware to complete the installation." 1986 1987 1988 1989 1990 1991 1992 1993 1994 1995 1996 1997 1998 1999 2000 2001 2002 2003 2004 GT 5.0L 4.6L V8 Mustang Roush & Saleen Vehicles.